Showing 41 articles from October 21, 2015. 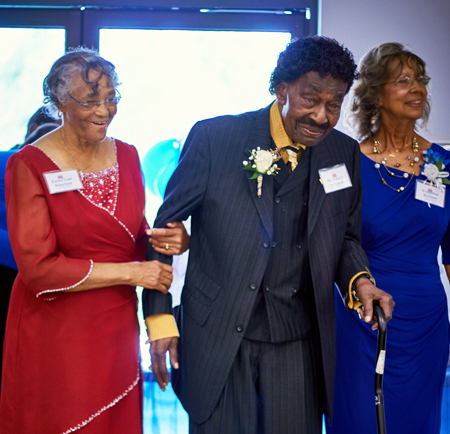 A Franklin County community leader and icon, Asher Frank Johnson Jr., died shortly after noon Wednesday, Oct. 21, 2015 after a period of declining health. He was 87. 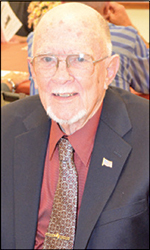 He spent much of his life around The Franklin Times, beginning as a youngster when he helped his father, Asher F. Johnson, Sr., as a "printer's devil" in the newspaper and printing business. HIS- AND HER-STORY. 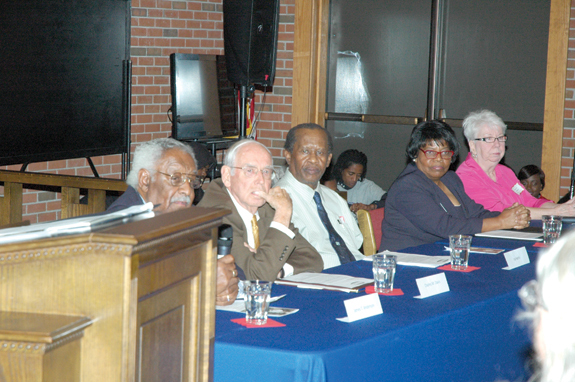 From left, Teo Anderson, Charles Davis, Ira Harris, Dr. Elizabeth Keith and Grace Stafford were panelists this week, sharing their stories of school system integration. LOUISBURG -- Before school integration, Teo Anderson was reminded everyday what he had; and what he didn't have. What he had was sore feet from walking 3.5 miles -- past the all-white Mills School -- to the Old Graded School in Louisburg. He also had a sore back from having to bend down to draw water from a branch that flowed behind the school. And, in the winter, he had no feeling in his feet because they were often frozen solid sitting in a school with no heat. Will state's new budget help speed up U.S. 401? LOUISBURG -- Construction of the long-awaited Section C of U.S. 401 in Franklin County could be coming sooner than expected thanks to an influx of money the Department of Transportation received in the new state budget. That's according to State Sen. Chad Barefoot, who attended Monday night's Louisburg Town Council meeting to explain how the budget will affect this area. Even though the North Carolina Department of Transportation has gone to a "data driven" concept for deciding which projects get built, Barefoot said legislators hope to speed up several projects across the state by providing more construction money sooner. The store where two teens purchased beer hours before one of them died in an alcohol-related crash was cited two years ago for selling alcohol to a minor. N.C. Alcohol Law Enforcement agents charged Nagib Salem Ala with two counts of selling beer to persons less than 21 years of age -- misdemeanors. Agents allege that Perry Frazier, 18, and Dustin Garriss, 18, bought beer from the Ingleside Grocery on N.C. 39 North the evening of Oct. 9. Just before 2 a.m. on Oct. 10, the State Highway Patrol alleges Frazier was driving a pickup truck on Hodges Road at a high rate of speed when he rounded a curve and lost control of the vehicle, hitting two trees and getting ejected from the vehicle. PINNED. 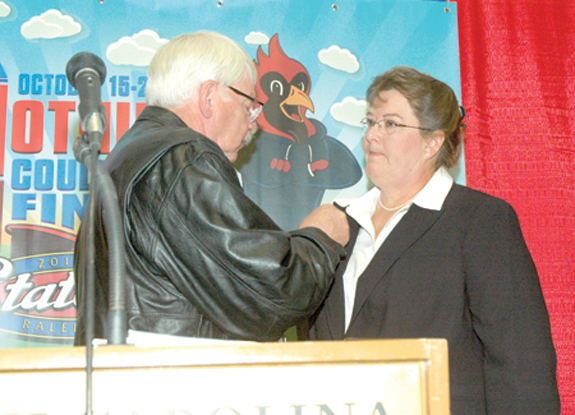 State Agriculture Commissioner Steve Troxler places a pin on Martha Mobley during a State Fair Livestock Hall of Fame enshrinement of her late husband, Steve. RALEIGH -- Steve Mobley passed away in the summer of 2013, but his passion for horses and agriculture lives on through the work of his wife, Martha -- helping small farmers make their way and rewarding youngsters who enjoy horses. Because of his efforts, State Agriculture Commissioner Steve Troxler inducted him and two other people into the N.C. State Fair Livestock Hall of Fame during an enshrinement ceremony at the Jim Graham Building on Oct. 18. YOUNGSVILLE -- The town board has set a public hearing next month to further discuss an incentive plan to spur residential development. During the board's Oct. 15 meeting, representatives with the town's planning and zoning consultants, N•FOCUS, presented a draft Youngsville Enhancement Projects Reimbursement Policy. Essentially, the plan would put in place a mechanism by which the town could offer an incentive to those who develop subdivisions. After last week's story about cost of maintaining Franklin County schools for the next decade was published, I suspect there were a few shocked folks around. The price tag was $67 million, which is a good guesstimate, perhaps one of the best long-term looks at what it takes to maintain the county's huge education infrastructure. And it is huge! The district now has 17 school sites and three administrative sites. There are 91 buildings, 18 mobile units and 1,559,613 square feet of building space spread across 503 acres, according to Tommy Piper, assistant superintendent in charge of buildings and grounds. There it is, in black and white, although the actual sign is red lettering on a white background. These simple, rather crude signs were erected at both the North Main Street and North Bickett Boulevard driveways to the former Novant Health Franklin Medical Center last Friday. Not unexpectedly, the hospital's owner pounced on its first opportunity to take its name off the medical facility, switching out the signs even before it was fully closed. There wasn't much on the agenda at the latest Franklin County Board of Commissioners meeting. But that doesn't mean it was a waste of time. Franklin County resident Felix Allen challenged the governing board to do better. Or, at least, do something. "Franklin County government is failing its citizens," Allen told the board during the public comment section of the meeting. Novant Heath states in spite of their best effort, they could not adjust their business model to sustain profitability. I guess it could be said they are callous for walking away, but you know it was no secret when they came here; it was not to lose money or function as a charity. It was also no secret for decades others tried and failed to sustain this hospital. I am sure they made promises, and our local leadership was more than willing to take their offer. Understandably so, they were not getting overrun with offers. If you live "in the county" you have my permission to skip this article. If you live in Bunn, Centerville, Franklinton, Louisburg, Youngsville or Wake Forest, this one's for you. Today is the first day of early voting in municipal elections in Franklin County. 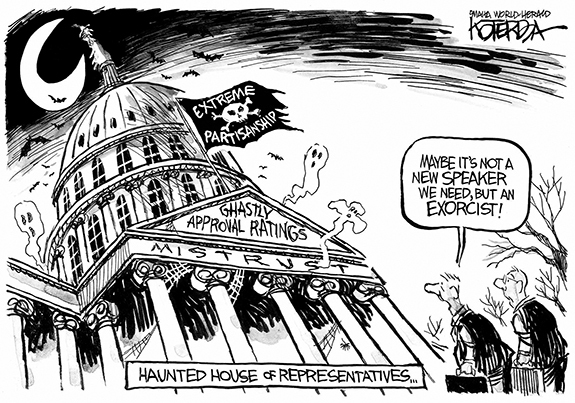 If history is any guide, a ridiculously small number of people will decide who runs their local government. LOUISBURG - Funeral services for Elmelean Rogers, 66, who died Tuesday, Oct. 20, 2015, will be held 1 p.m. Saturday, Oct. 24, at the Richardson Funeral Home Chapel. MCKENZIE ON THE MOVE. 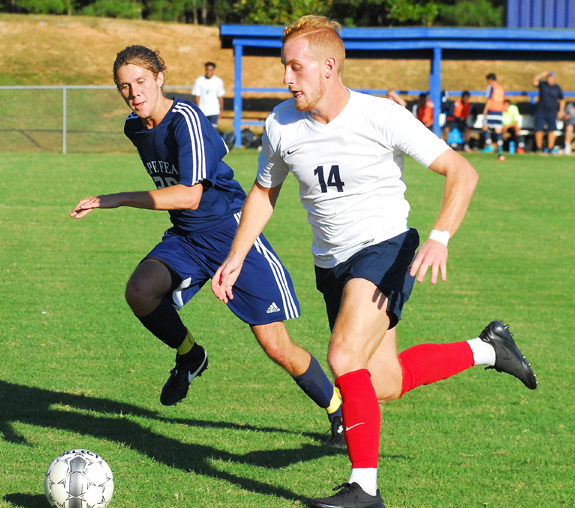 Louisburg College's Austin McKenzie (right) soars through the midfield during last Wednesday's home soccer decision over Region X rival Cape Fear Community College at Ronald May Field. 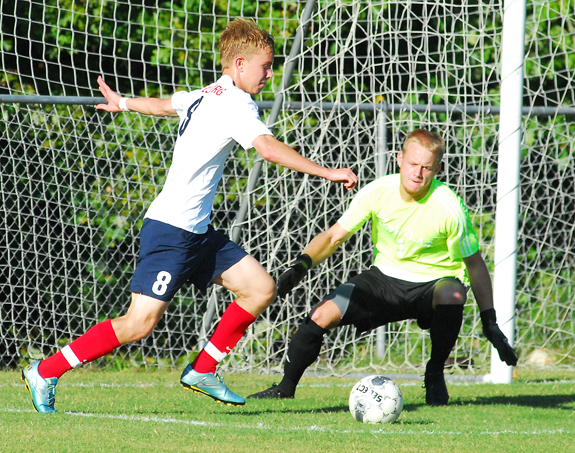 LOUISBURG -- Louisburg College's tradition-rich men's soccer program dropped its second match of the season way back in August -- and the Hurricanes haven't lost since. Because of that stretch, Louisburg has moved all the way up to the No. 1 position in the latest National Junior College Athletic Association national poll. LC, coached by Martin Dell, is now 13-1 overall and on a 12-match winning streak with three events remaining in the regular season. LUCKY 13. Girls individual winner Haley Sheehan from Bunn sprints past the old 13th Hole tee box sign at Bull Creek during last Saturday's Franklin County Cross Country Championships. LOUISBURG -- History was made on two fronts last Saturday morning at the former Bull Creek Golf Course. Now known as Owens Park and still in the developmental stages, the facility hosted its first-ever official event -- the new Franklin County Cross Country Championships. Teams from Franklinton, Louisburg and Bunn participated, with FHS taking first place in both the boys and girls team standings. LOW TO THE GROUND. 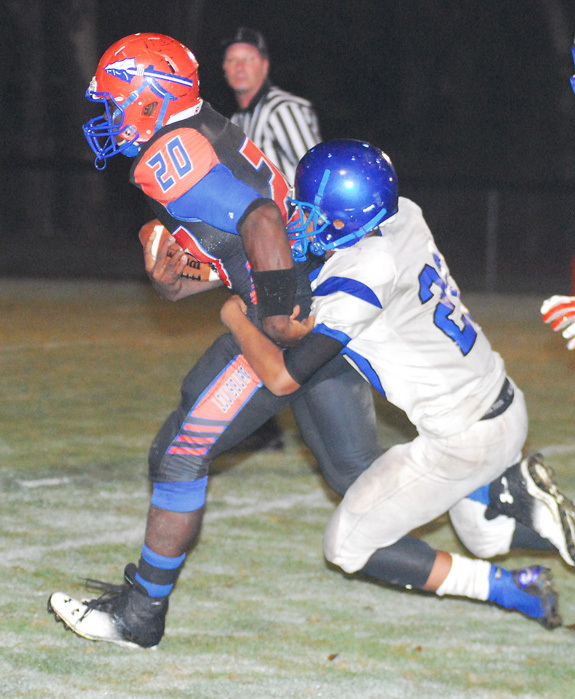 Louisburg High School's Octavius Scoggins (with ball) engages a KIPP tackler during last Friday night's football game. 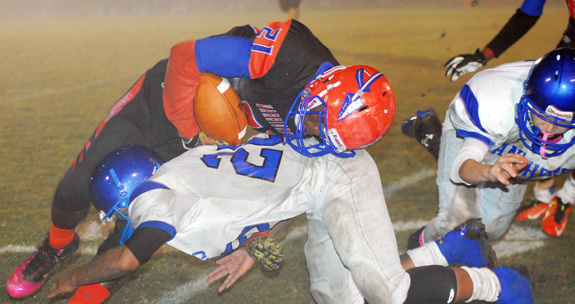 LOUISBURG -- Another week, another heart-wrenching loss for the Louisburg Warriors. Just like their Tar-Roanoke Athletic Conference opener one week earlier at Southeast Halifax, the winless Warriors moved inside the 5-yard line in the closing minutes of last Friday's league matchup versus KIPP Pride at Patterson Field. After a successful fourth-down conversion, Louisburg seemed destined to find the end zone, but it wasn't meant to be. MAKING A PUSH. Franklinton's Britney Davis (right) sends a push past Bunn's Erln Collier during last Thursday's volleyball showdown. 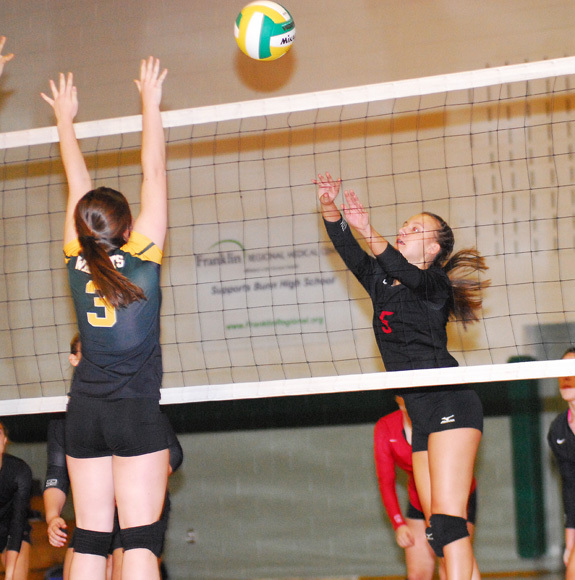 BUNN -- The volleyball rivalry between Franklinton and Bunn took a pair of wacky turns over the past week. Bunn had topped FHS earlier in the season on the road in Northern Carolina Conference action, but the Lady Rams returned the favor with a three-set sweep of the Ladycats in last Thursday's regular season finale at the Bunn Dome. The victory brought FHS second place in the NCC standings behind leader South Granville. ADAMS ON HIS WAY. 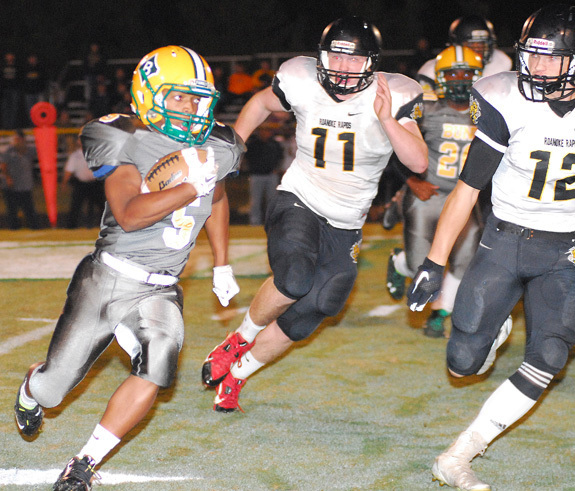 Bunn's Bruce Adams (with ball) gains yardage around the right side during last Friday's home gridiron triumph over conference rival Roanoke Rapids. 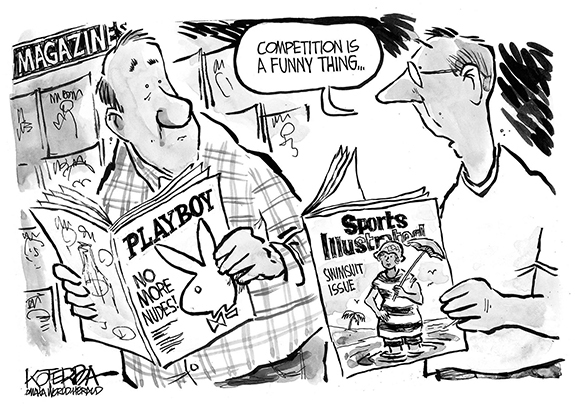 BUNN -- Those who consider David Howle to be a conservative football coach might want to rethink that assessment. Howle and his Bunn Wildcats took some first-half gambles during last Friday's physical home showdown against Northern Carolina Conference foe Roanoke Rapids. With a share of the top spot in the NCC at stake, the Wildcats were rewarded for their daring display by pulling away for a 42-7 decision over the Yellow Jackets. Bunn is now 6-2 overall and 2-0 in the NCC, leaving the Wildcats in a first-place tie with South Granville. ADVANCED PLACEMENT. Louisburg's Tyree Yancey heads the ball forward during the Warriors' home victory Monday evening against KIPP Pride at Joyner Park in Louisburg. LOUISBURG -- Granville Central may have wrapped up the Tar-Roanoke Athletic Conference boys regular season soccer championship, but there are still spots available out of the TRAC for the upcoming Class 1-A State Playoffs. Louisburg took a huge step toward garnering a postseason position on Monday as the Warriors defeated league rival KIPP Pride by a 6-1 margin at Joyner Park. With the win, the Warriors improved to 4-6-2 overall under veteran head coach Chris Cannady. 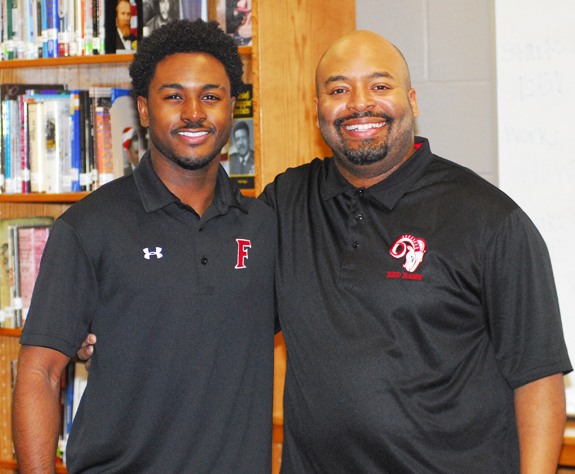 WARRENTON -- Tyreese Williams delivered four touchdowns -- including two in the closing minutes -- as the Franklinton Red Rams pulled away to defeat homestanding Warren County last Friday in a crucial Northern Carolina Conference football matchup. After WCHS clawed back to tie the score, Franklinton put together two nifty drives to wrap up the decision. FHS is now 4-4 overall and 1-1 in the NCC. The Red Rams will travel to Roanoke Rapids next Friday in a key swing game in the league standings. 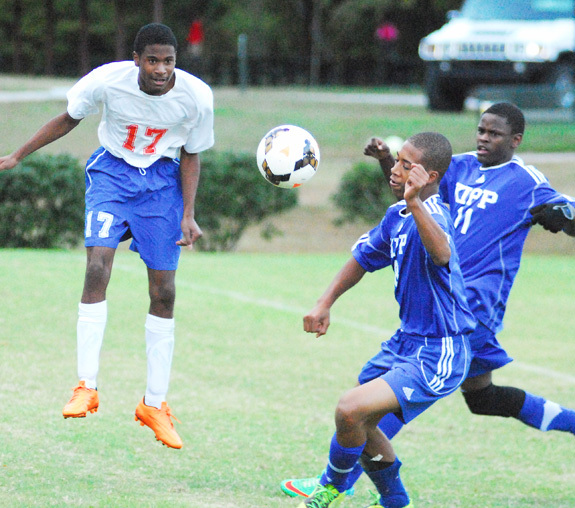 HENDERSON -- The Kerr-Vance Academy Spartans boys soccer team bounced back from its second tie of the week one day earlier with a 4-0 win over Crossroads Christian School for Homecoming last Friday evening. Joseph Burnette opened the scoring for the Spartans about 18 minutes into the match off of an assist from his fellow senior captain Jordan Smith. Smith normally plays in goal, but Spartan Coach Devon Honeywell opted to give backup goalie Cam Pritchett more playing time as the team prepares for the stretch run of the season and a possible state tournament bid. LOUISBURG -- Jay Koloseus knows a thing or two about the course that will host the Region X Cross Country Championships this Saturday. After all, Koloseus, Louisburg College's head coach, designed the layout at Owens Park -- the former site of the Bull Creek Golf Course. 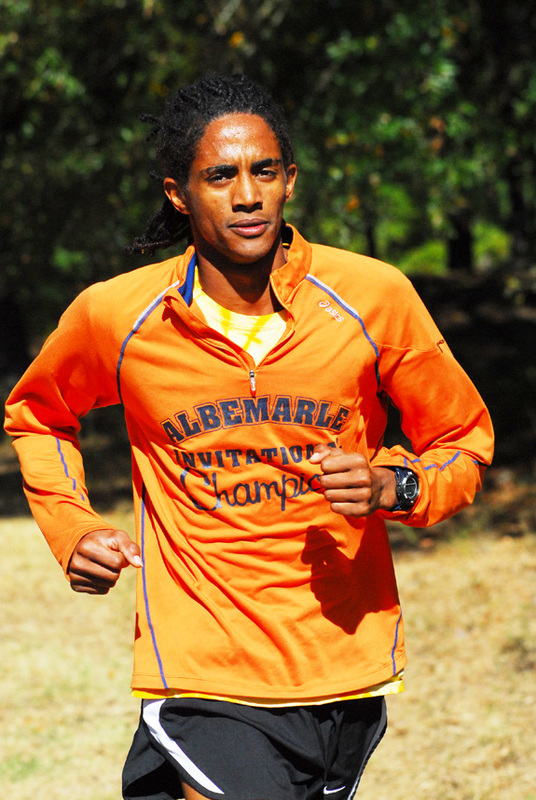 Koloseus and his runners have been training at the facility in anticipation of this weekend's event, which will have spots in the national championships going to the team champion in both the men's and women's races. YOUNGSVILLE -- A benefit golf tournament for Dexter Cooley will be held Oct. 26 at the Olde Liberty Golf Course. Cooley is a Bunn native who was a basketball star for the Wildcats. Cooley also coached at Bunn High School after his collegiate playing career. He went on to become a successful coach and athletic director at Wakefield High School in Wake County. 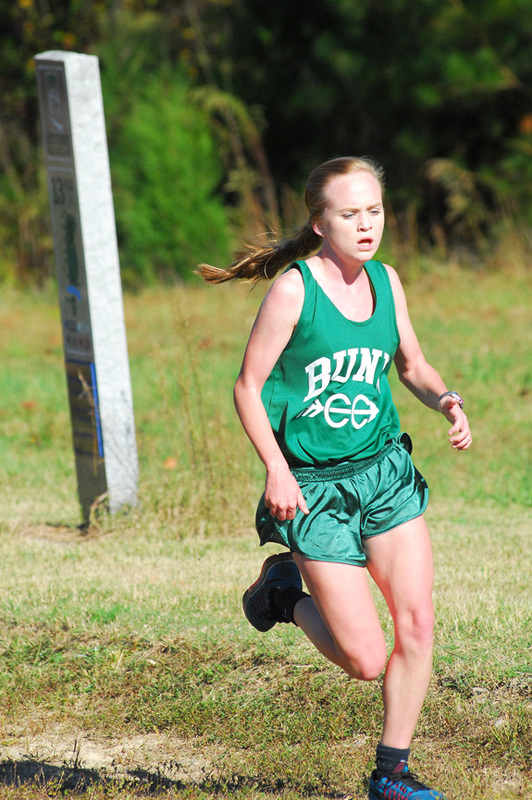 DURHAM -- A combined five runners and two coaches from Franklinton and Bunn were saluted during Tuesday's Northern Carolina Conference Cross Country Championships at Forest Hills Park. Franklinton's Logan Hornyak and Baretta Exley earned spots on the Boys All-NCC Team, while FHS' Joanna Henry and Hannah Styers, along with Bunn's Haley Sheehan, were picks for the Girls All-NCC Team. COACHING CLINIC. West Johnston's Meredith Edwards Blake (second from left) encourages her team during a recent Greater Neuse River Conference volleyball matchup. Blake prepped at Bunn HS. BENSON -- Once a Wildcat, always a Wildcats. Franklin County native Meredith (Edwards) Blake couldn't help but ponder the symbolism when she was named the head volleyball coach this summer of the West Johnston High School Wildcats. After all, Blake had been a Wildcat at Bunn and was a part of three conference championship clubs under Coach Henry Jones. 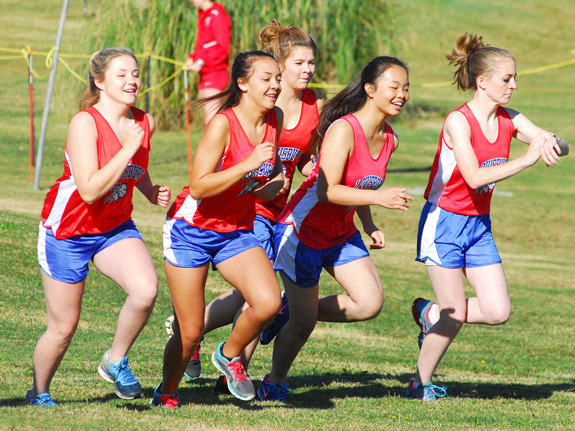 Members of the Louisburg HIgh School girls roster leave the starting line at the Franklin County Cross Country Championships. Louisburg High School's Terry Allen (left) almost scored on this run during the final drive of the contest -- but the Panthers' last line of defense came up with a clutch tackle. UNDEFEATED INTIMIDATORS. 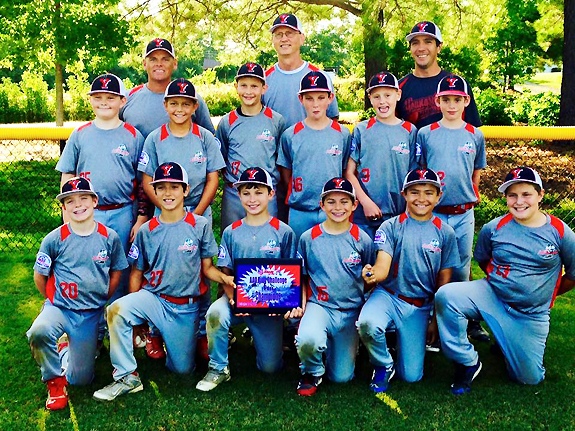 The Youngsville 11-Under Intimidators went undefeated to claim the championship at the King of Rings Baseball Tournament on Oct. 10-11 in Oxford. In September, Youngsville put together a perfect mark to nab the crown at the AAU Ring Challenge Tournament. Each player received a signet ring after each championship game at both of the tournaments. The club's next tourney will be the Winter World Series from Oct. 23-25. 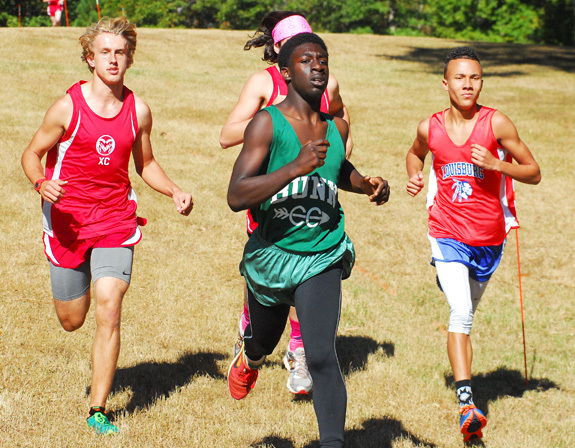 Bunn's Jalen Kelly maintains a lead at the halfway mark of the boys race at the Franklin County Cross Country Championships last Saturday at Owens Park. Louisburg College's Ben Foulds (left) tries to dribble past the Cape Fear CC keeper during last Wednesday's Region X soccer match. During the Great Depression, the United States Treasury Department funded the construction of new post offices throughout the United States. These projects not only provided work for many people, but also improved the built environment of small towns and lifted the spirits of their citizens. Louisburg benefitted from this trend. According to The Franklin Times, the town had sought a new post office for "twenty-five years or more." Congressman Harold D. Cooley announced in June 1936 that the United States Treasury Department and the postmaster general had allotted funds for the purchase of a lot on which the government planned to build a new federal building. A night of well-crafted, Halloween-themed one act plays will be presented as "The Trilogy of Terror" at the intimate Norris Theatre on the Louisburg College campus. Shows are scheduled for 7:30 p.m., Oct. 23, 24, 27, 29 and 30, as well as a 2 p.m., performance Oct. 25. Conceived and written by George Cameron Grant, these shows will be presented as a full evening of theatre. LOUISBURG -- After about 45 days on the job, Franklin County Schools Superintendent Pascal Mubenga gave the school board a quick update on how he sees the situation and what he's doing to make things better during the Oct. 12 board meeting. Dr. Mubenga noted that the district has seven of its 16 schools listed as low-performing, including Franklinton Elementary, Laurel Mill Elementary, Long Mill Elementary, Louisburg Elementary, Royal Elementary, Bunn Middle and Franklinton Middle. Franklin County sheriff's deputies have joined forces with two other agencies to investigate a suspected homicide. Authorities found the body of Henderson resident Eddie Ronald Davis Jr., 20, in a field in the 5800 block of U.S. 401 in Franklin County. Franklin County Sheriff's Office Chief of Staff Terry Wright said the case is being investigated as a homicide. "Based on the investigation at this time ... it appears that [the homicide] did occur in Franklin County," Wright said. 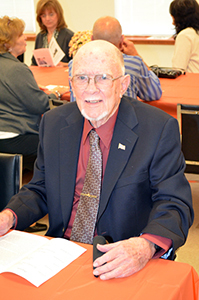 LOUISBURG -- A 100th birthday celebration was held recently for James L. Nicholson at the Louisburg Operations Center with many family members, loved ones, friends, and former students in attendance. Nicholson was escorted in by his surrogate daughter, Emma Brown Robertson, and former student, Evangeline Boone Rickman. Nicholson was able to walk in with only the aid of a cane. At the age of 100, he still has excellent vision, good hearing, and a phenomenal memory. 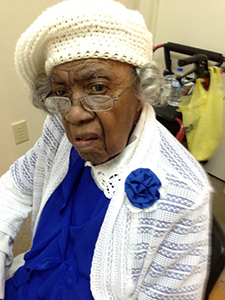 The 101st Birthday celebration of Emma Richardson of Louisburg was held on Sunday, Sept. 13. 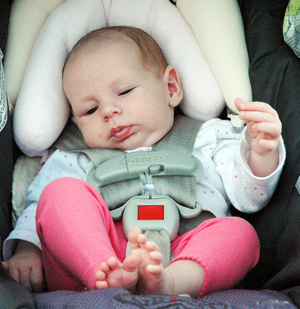 Emma was born in Warren County on Sept. 9, 1914, but she was raised in Franklin County. The celebration was given by her twin daughters, Vernice Harris and Bernice Richardson, with family members attending. 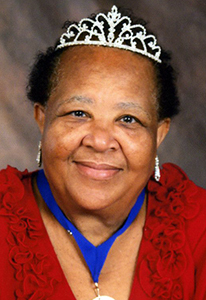 Hazel Bolton Kearney, a resident of Warrenton, was crowned the 2015 Queen of the Interdenominational Ushers Association of North Carolina, Inc. at their recent annual session banquet held in Raleigh. She is president of the Franklin County Ushers Union and is a member of New Liberty Baptist Church where she serves as Usher Board vice president and Junior Usher advisor. 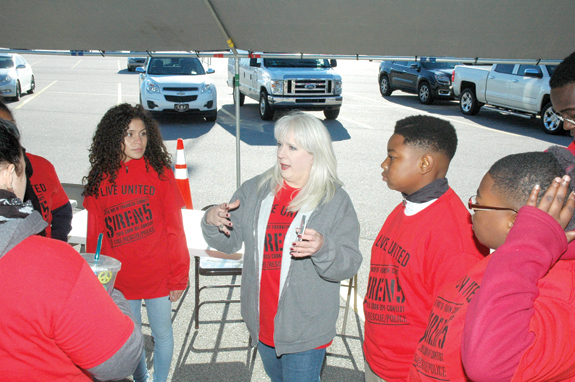 Above, United Way of Franklin County Executive Director Kathy Harrelson, center, gets volunteers ready to help during the SIREN5 Cookoff Contest last Saturday. The fundraiser pitted law enforcement and EMS units against each other, battling to see who made the best chicken, barbecue and sauce. They also sold plates, with proceeds going back to the units.